Welcome and thanks for visiting. Below are my current and past projects. Click on the above menu or any of the projects below for additional information. Should you have the need to email me, please do so at: ROlszewski@aol.com. Sign up to receive my announcements by clicking here. Ten years in the making, this book is about the legendary submarine TUNNY, (SS, SSG, APSS, LPSS-282) and is now available in a revised and updated first print limited edition. This book is the only book published that tells Tunny's unmatched history and much more. It pays tribute to those who served on her during WW II, the Cold War, and Vietnam and a major feature is that every sailor who served on Tunny is named in this book. If you served on Tunny 282, your name is among the nearly 1,530 former crew members identified in seventeen chapters that describe the Tunny's unique past. What makes this book unique is that all the names of former crew members who made Tunny's 9 combat war patrols in WW II, 10 Regulus Deterrent patrols during the Cold War, and 14 Special Operations in Vietnam are listed. They are listed in three tables by name and the patrols/deployments they made. The book not only identifies by name those who served on Tunny but also provides what achievements this submarine made over its service to our country and what life was like aboard a fleet diesel submarine. In addition to the names, and where the information was available, their backgrounds are included all packed into 682 pages of large readable print bound in a quality displayable full-color 8.5" x 11" hard cover. This 'coffee table' book is being released as a first print limited edition of only 282 copies sold only by the author, Ray Olszewski. Ray, himself, is a former Tunny crewmember who served on Tunny from 1958 to 1962. Ray was Tunny's longest serving Yeoman on Tunny, four years. Each book is printed with a unique sequential number "1" through "282" and each book purchased from the author will be personally signed. This rendering presents historic information unlike no other previously published or ever published before about the legandary diesel submarine Tunny. This book documents for the first time, Cold War and Vietnam achievements for a U.S. Navy submarine. For someone who served or knows someone who served on the diesel submarine Tunny, this book is for them. Click here if you want to see the list of the 1,530 former crewmembers who are named in the book. You will have to buy the book to see what the author has found out about many of them. Lots of stories about those who served on Tunny. Find the name of someone you know of the 1,530 who served on Tunny. 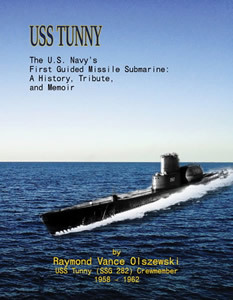 Read the chapter about how 11 men sealed the entire crew of the USS Ronquil (SS 396) in their submarine while a small number of the Tunny's crew stole their mascot. See who made the most of the 9 combat war patrols during WW II, the ten Regulus patrols, and the 14 SPECOPS deployments. Read their bios and those of Tunny's 14 CO's, 19 XO's, and 18 COB's. Lots, lots more information is packed into 682 pages of what some call hurculean and monumental research. Were you a member of the NPYC? Read about its origin and who became members of this distinguished group of men and their submarines who made 42 arduous Regulus missile deterrent patrols between 1958 and 1964. The book began selling in late November 2018 and inventory of the 282 copies is dwindling. The opportunity to purchase the book at a 'reduced price' was first offered to those who served on Tunny, those relations of those who have since departed on Eternal Patrol, and friends and family of the author. This limited time offer will soon end. To purchase your personally autographed copy, click here. There are a number of options available to make your purchase to include, check, money order, online purchase, credit card, or calling the author directly. Communications received from former Tunny crewmembers and/or their relations are telling me how impressed they are with the book. Click here to read the comments that have been received. A note for visitors related to the USS Ronquil (SS 396), I've devoted a whole chapter in my book to the taking your Tiger in April 1959. Click the book's cover for more information! Former shipmates, family and friends, and some others have been sent separate communications to take advantage of the SPECIAL ONE TIME and LIMITED OFFER to purchase the book at a "SPECIAL PRICE". If you received this offer by email or a postcard, you are entitled to purchase this book at SPECIAL PRICE. All forms of payments accepted, checks, charge cards, etc. mailed or online, or by phone. Each book purchased will be autographed, gift wrapped and shipped by USPS Priority Mail. If you are not one of those who did not receive this SPECIAL OFFER, click here to sign up to be on our mailing list or send an email to the author. Or call should you have any questions - (703) 244-5678. SPECIAL PRICE LIMITED TIME OFFER ONLY! If you received a communication from the author, this limited time offer is for you. Orders received at this price will be verified. If you would like to receive special price offerings, click here to sign up to our email list. Hear and watch Ray Talk about his 23-year Navy Career in just 13 minutes! A Tribute to Those Who Served! Three Alle-Kiski Valley (Creighton, Natrona Heights, and Brackenridge) Veteran's Memorials include Olszewski and Ajak family members who served during World War II. Their names are imortalized on these beautiful memorials. Click here to see the photos I captured during a visit in 2018 of the monuments, their locations, and the names who are listed. This is a website I created for my friend Quartermaster Dan Moss who asked me to create it for his project to raise funds for the Arizona Silent Service Memorial (ASSM) in Phoenix, Arizona. The website was established on 3/28/2015. OLSZEWSKI "One who lives by the Alder Tree"
This work captures as much information I have found and documented information about these two family's who settled in Western Pennsylvania in the late 1800s. It is a continuum of a work and as information is received, the Olszewski/Ajak Family Tree posted on Ancestry.com is updated accordingly. For members of Olszewski or Ajak families, should you have corrections or changes that you know to be different than what is presented, please contact me directly at: ROlszewski@aol.com. Click here to take you to this gift of work I have created for my relatives. Should you be interested in taking over the project, please contact me. let me know. This builds upon information I found through over 8 years of research relative to the origin and history of this 19th Century cemetery. It provides a detailed history of the souls whose bodies are buried at the cemetery, their history, and their ties to the La Grange property, which today serves as a Virginia Farm winery, The Winery at La Grange, Haymarket, Virginia. The article published by the Virginia Genealogical Society, brings attention to the diminishing and deteriorating condition of the cemetery with hope that its poor state will be corrected, hopefully, someday. This book was self-published in 2011 and is available for purchase from the author. A 16-page coloring book that describes the story of a car found abandoned in a junk yard by a gentleman who took it home and reconditioned it. It is a simple and expressive story that deals with a negative situation. As one turns the pages, the reader experiences the ability to read positive words and through coloration can express their feelings about this story's positive message. This book was self-published in 2010 and is available for purchase from the author. Click here for more information about Chucky the Car background. A trued Story! What is described in this story actually happened to me when I was a teenager working at Kramarick's Upholstering located in Tarentum, Pennsylvania (near my home town of Natrona Heights, PA). What's The Score After the Round? Results of an Analysis conducted of wine lists from Publics, Privates, and The Resorts. A Taste of Prince William County Wine History: Who Knew? Haymarket - Prince William County's Viticultural Center: Who Knew? 1900 Paris Exposition: Who Knew? This is a website I created for my brother, Robert William Olszewski (B:1945), who is an artist that produces art for The Disney Company. Olszewski Studios website was launched in 2006 as an informational and historical reference for all of the art Robert has created since high school (Har-Brack 1963). He became a miniature artist for the world renown Goebel Company; the very same company that produced the M.I. Hummel porcelain figurines. Today, Olszewski continues to produce art for the Walt Disney Company under the business name of Olszewski Studios. This is the artist's on-line store that sells Olszewski art. This is the website I created for my classmates and is a tribute to them.